Are you having ham for Easter? 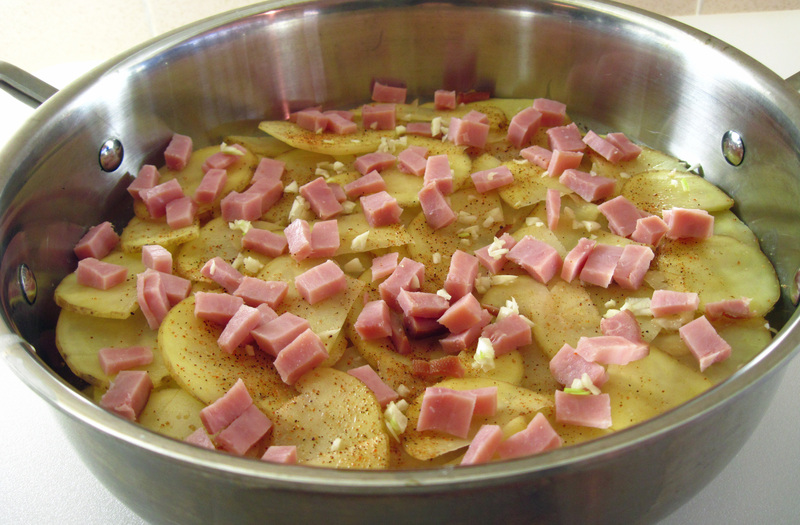 If you are, you should rejoice if you have leftover ham for this recipe! 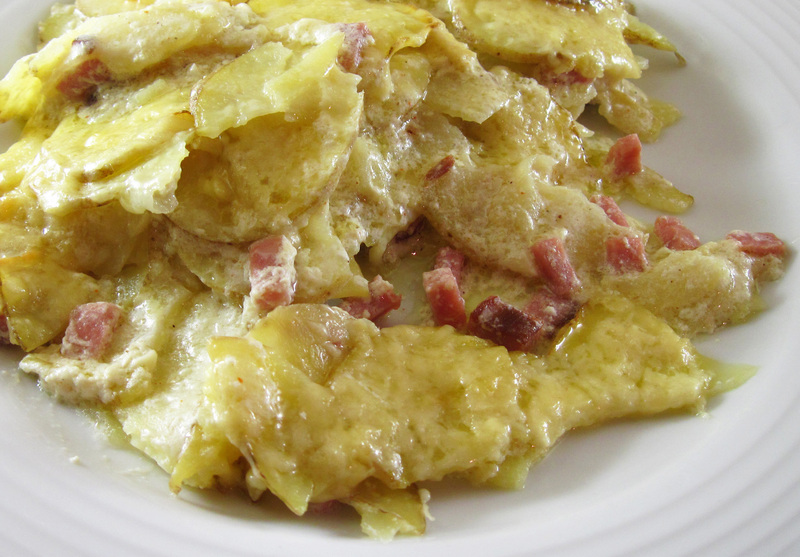 Bob declared that Creamy Yukon Gold Potato Gratin from One Pan, Two Plates by Carla Snyder is a “5 Star recipe”. One of the best ever! And I agree. I have made it two times this week and I can’t wait to try it with some of the leftover Snake River Farms ham after Easter Sunday dinner. This is a very rich recipe, though it’s not as rich as it is intended to be. Carla uses 1½ cups heavy cream. Now, I’m not one who has a fear of fat, but I just couldn’t do that. I used half and half and it was fabulous. It was still rich and luxurious and oh-so satisfying. The recipe is meant to be a main course for two, with very generous servings. I saved a small portion of mine to enjoy the next day. If served as a side dish it would easily serve four. I bought a small 8-ounce ham steak ( Hormel Cure 81) and used half of it for this recipe. I was going to save the other half for something else, but we liked it so much I just made this recipe again. 2. Scrub the potatoes; you don’t have to peel them. Slice them in half lengthwise. Slice each half into very thin slices. 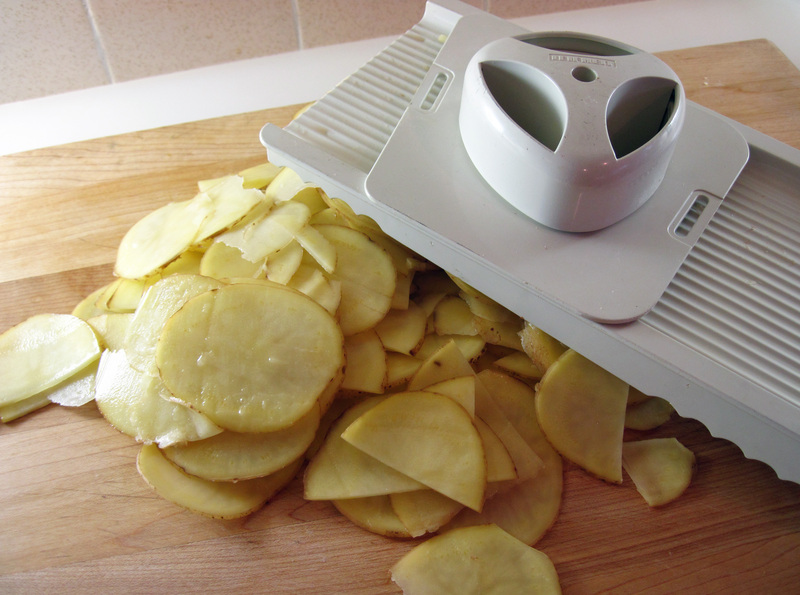 I used a mandoline but it could be done with a sharp, thin knife. Use the guard on your mandoline to protect your fingers! 3. Melt the butter in a 10- or 12-inch ovenproof skillet on the stovetop. Remove from the heat. 4. Make a layer of 1/3 of the potato slices over the bottom of the skillet. Sprinkle with a bit of the seasoned salt. (With the ham, you don’t want to use too much salt.) Add a layer of half of the diced ham and half of the garlic. 5. Make another layer with another third of the potato slices. Sprinkle with a bit more salt and add the rest of the ham and the garlic. 6. Pour 3/4 cup of the half and half over the potatoes. 7. Layer the rest of the potatoes over the top. Gently press the potatoes down a bit with your hand. 8. Pour the remaining 3/4 cup of half and half over the potatoes. 9. Put the pan back on the burner over medium heat; heat until the half and half is bubbling. 10. Put the pan in the oven and bake for 30 minutes. 11. 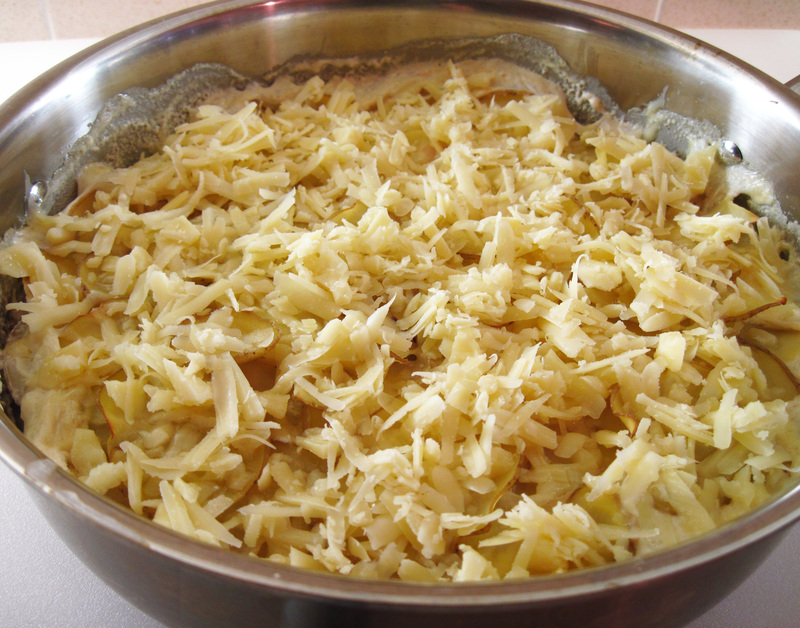 Remove from the oven and sprinkle the grated Gruyère cheese over the potatoes. 12. Return the pan to the oven and bake for another 15 minutes. 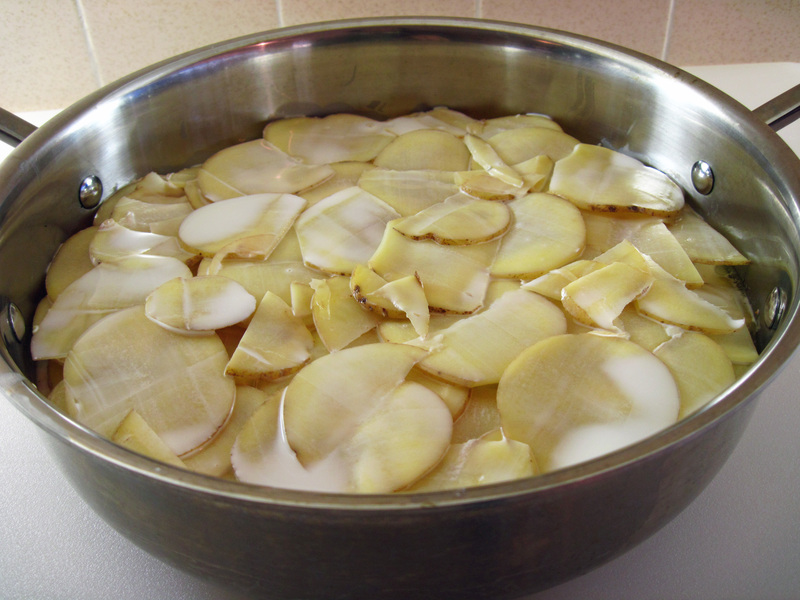 Check the potatoes by piercing the casserole with a sharp knife to see if they’re done. 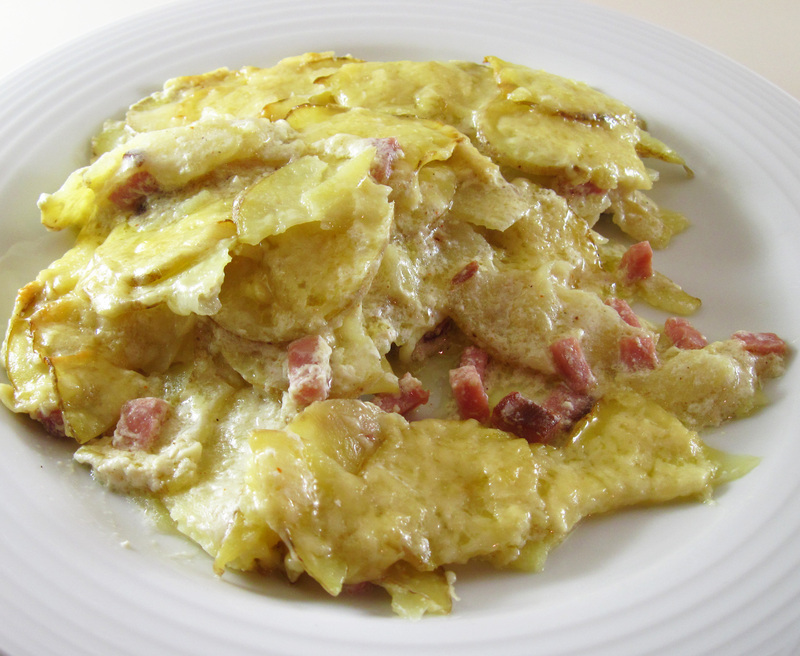 I served a super healthy salad with the potato gratin to balance the meal. 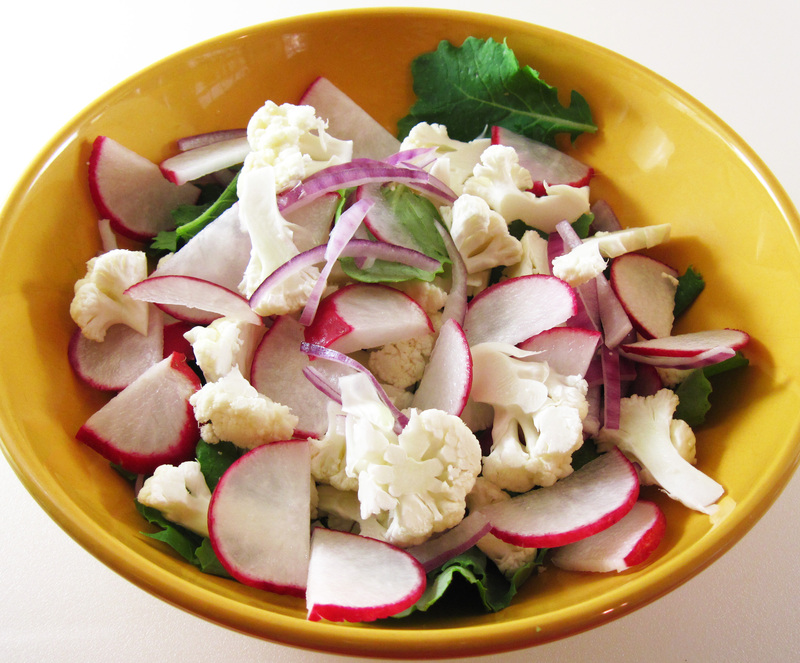 It included baby kale, raw cauliflower, radishes, and red onion tossed with just a bit of olive oil and white balsamic vinegar. This is why I chose a fragrant pepper in my kitchen: Pepper Kampot. 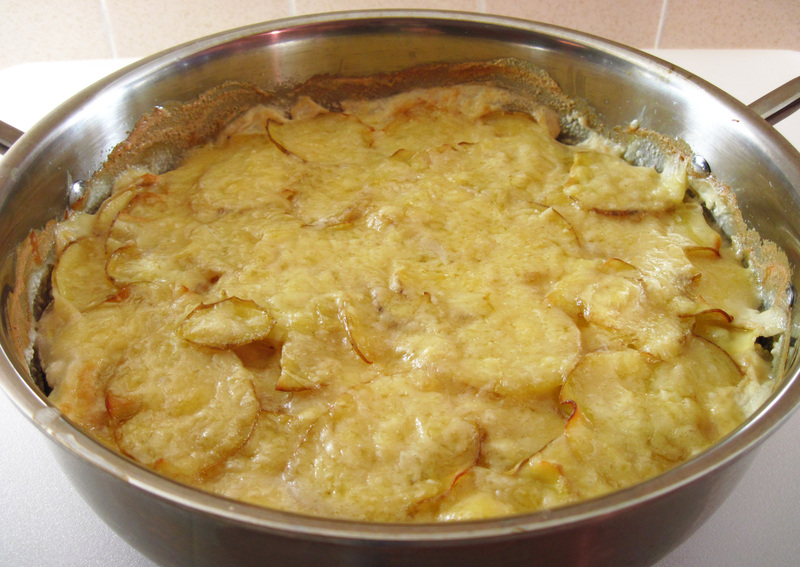 So delicious for transcend your potato gratin. I use a pretty flavorful pepper, but I have not heard of Pepper Kampot. Thanks for the tip.